I prepared this recipe as part of this month's Secret Recipe Club. By participating, I was assigned a food blog to check out and try a recipe from their site. This recipe comes from Jessica of The Jey of Cooking. How could I be so lucky?! Jessica happens to be a dear friend who I happen to know personally. Our kiddies have had kitchen playdates where other moms and their children have come over to play and enjoy time together with a food theme. I was thrilled to try something from her blog (which wouldn't be the first time) and it didn't take long for me to find a recipe I knew I'd love. Gluten free friends, did you know gluten free pretzels are now available?! I came across GF pretzel sticks at the local grocery store (see link below) and immediately bought them to snack on. Shortly after purchasing my pretzels, I stumbled along this recipe with perfect timing. When I saw the recipe for Pretzel Fudge on Jessica's blog, I was immediately drawn to the sweet and salty combination of chocolate and pretzels. The idea of pairing the two reminded me of the Chubby Hubby ice cream flavor and that's when I decided to throw in some peanut butter to the mix. After playing around with ingredient quantities, I had a delicious fudge that was sweet, salty, creamy and crunchy. Oh, and did I mention that this is ridiculously easy to make? Simply have a mixing bowl, wooden spoon, your microwave and a pan ready - that's all you'll need to make this! Lightly grease a 9×13 baking dish and line with parchment paper, leaving enough extra at the ends to cover the finished fudge and allow you to lift the fudge from the pan when chilled. Add the condensed milk, chocolate chips, butter and vanilla to a microwave safe bowl. Heat in 30 second increments, stirring each time, until melted – about 2 minutes. Stir in pretzels. Pour chocolate pretzel mixture into the prepared pan. Spread gently then press whole pretzels onto the top. Sprinkle sea salt over the top. Cover with the ends of the parchment and chill until firm. Speaking as an actual Chubby Hubby... Pass the plate! I like sweet and salty combined flavor =)great photo! So glad you loved the fudge. Hope to see you and Joel soon! I love how easy this is to put together! Looks delicious too! This is exactly what I need today! 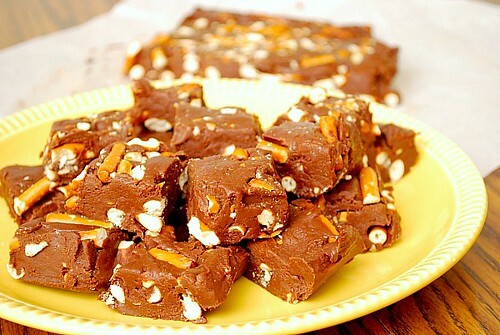 I'm totally craving fudge! Those squares look amazing. I can see how they'd make me chubby - I'd eat the entire batch if it was put in front of me! What a fun sweet treat for Valentine's Day. I really enjoyed learning about you and your blog through SRC this month and hope we have a chance to meet in the near future. Seems we have quite a bit in common. Yum! 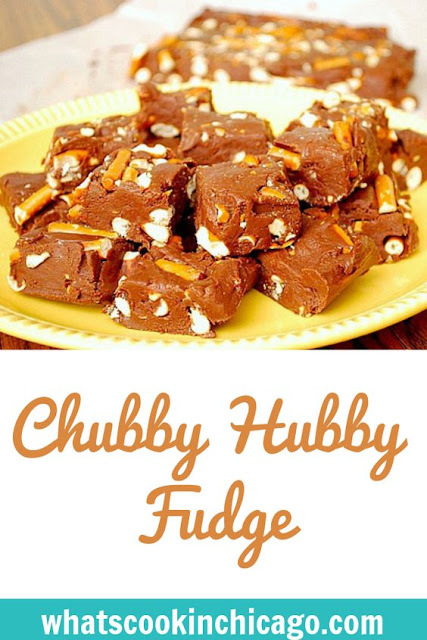 Chubby Hubby Fudge looks wonderful!! !